The grass is always greener on the other side we tell ourselves. It's better and I want it. Envy plagues us all. No one passes through life without envy. I should know, just the other day I was at my friends house and I just had to try out her new vacuum. Who covets a vacuum? This girl. My 18 month old daughter always envies the toy she doesn't have. Whatever her sister has is surely better and she starts squawking because she wants it. Envy starts young. Envy will eat away at us from the inside out. It will rob us of joy and peace and contentedness. 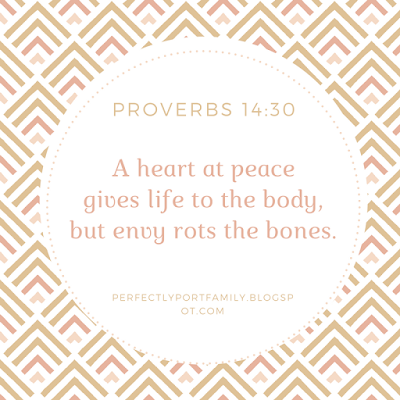 Solomon who wrote most of the book of proverbs says envy rots the bones. Our bones hold us up, provide strength and protect our internal organs and not only that but the bone marrow within the bone structure provides life giving nutrients to our blood. If our bones slowly rot away, our whole body will become weak and decayed. So metaphorically Solomon tells us envy will make us susceptible to spiritual decay and weakness. In the NLT version of the bible, it's translated, jealousy is like a cancer to the bones. Thankfully Solomon gives hope-- A heart at peace gives life to the body. 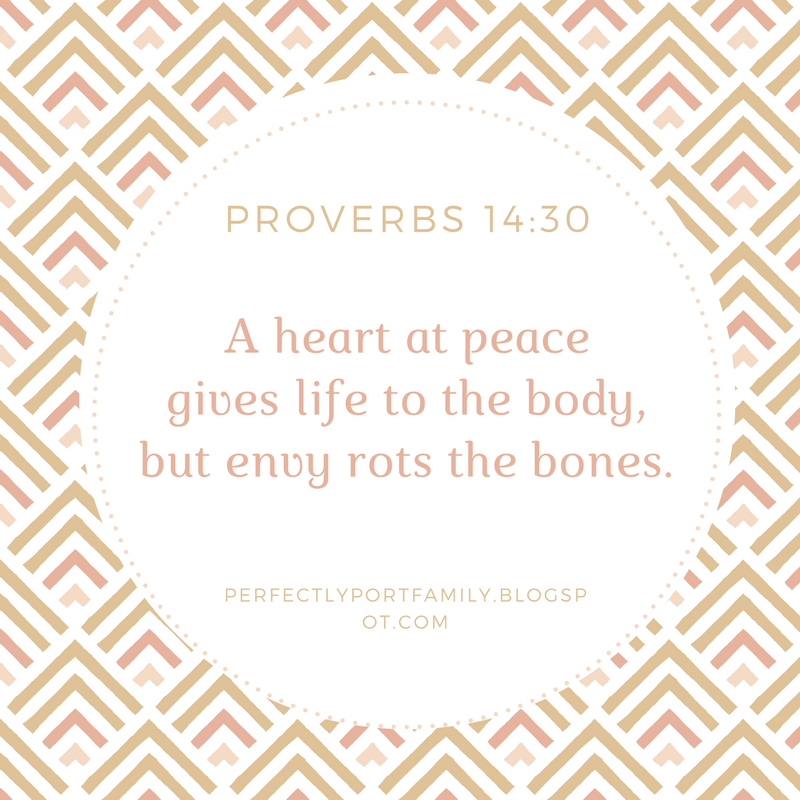 So how do you put away your envy in favor of a heart at peace? There will always be opportunity to envy. Someone will always have something you desire. My momma always told me no matter how much money you have, you will always want a dollar more. Envy begins with a self-centered, here and now attitude and ends when we are eternally minded. What we covet here on Earth will not go with us. Have you ever seen a u-haul behind a hurst? When we stop to evaluate the envious desire in light of whats to come, we can be thankful for what truly matters. Do not store up for yourselves treasures on earth where moths and vermin destroy and where thieves break in and steal. But store up for yourselves treasures in heaven where moths and vermin do not destroy, and where thieves do not break in and steal. For where your treasure is, there your heart will be also. What we treasure the most will control us. What controls your thoughts, actions and motives? We must consciously take our focus off of me and now and look to God and eternity. Envy focuses on what we don't have and contentedness focuses on all we do. Seek Him, repent and ask Him to renew your mind. We all envy but we can replace envy with contentedness. It's a choice. 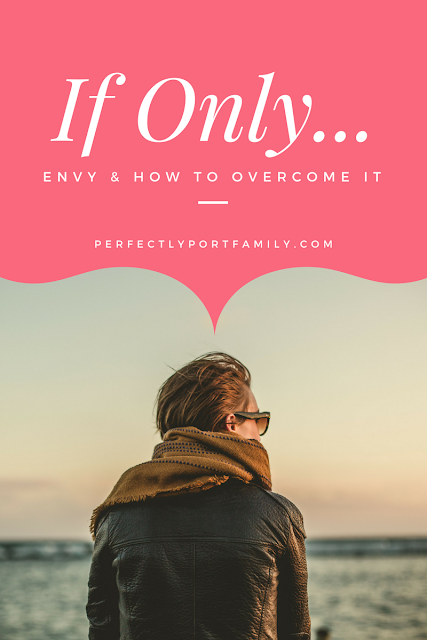 When envy plagues, we aren't stuck. That's something to be thankful for to start.